First Union Baptist Church is the oldest African American Baptist church established in the borough of the Bronx (2064 Grand Concourse). We recently celebrated our monumental 100th Anniversary (April 26, 2015), which culminates on Dec. 31, 2015. As we thank God for keeping us 100 years, we ask that people everywhere help us to save our church home, which is in danger of being foreclosed. Without your help, we will be out on the street in less than 60 days (June 30, 2015). Please donate towards First Union’s fundraising efforts to pay off a $1.5Million mortgage so that we may remain in our community and serve future generations. We ask that you give strong consideration to sustaining our existence for many years to come and join 15,000 churches around the country in collectively donating just $100 dollars, or giving an individual donation of any amount to help save our church. 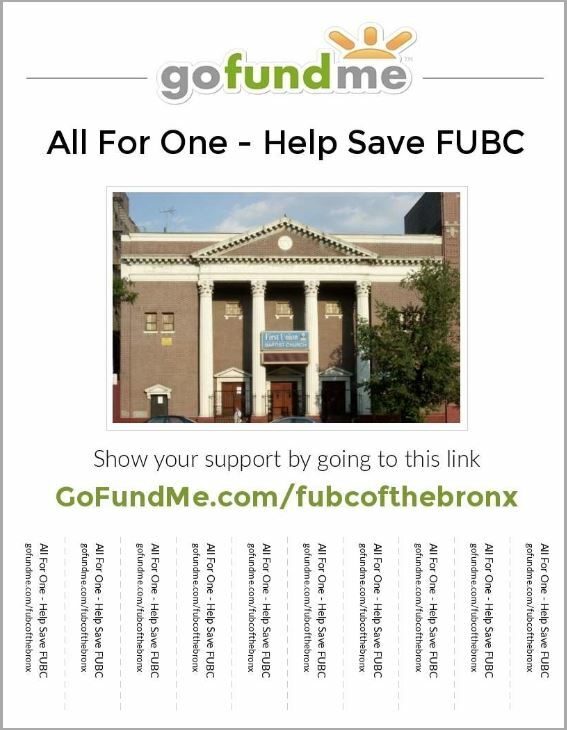 All For One, Help Save First Union Baptist Church! THANK YOU FOR PLANTING A SPIRITUAL SEED WITHIN OUR MINISTRY.